One day @ a time: Diwali with Aishwarya & Abhishek ! I celebrated Diwali with 130 kids this year, and to say the least, it was one of the most satisfying days of my life. As we walked into Sishu Mandir last Saturday morning, the kids were sitting in a circle, singing '100 miles'. They moved on to 'Jamaican Farewell' and then to the 'Happy song'. It was such a moving experience to sit there and watch them sing "...Lord I am five hundred miles away from home..." Most of them didn't even have a home! Sishu Mandir is an orphanage and education institute, doing a wonderful job at bringing some light into the otherwise dark lives of many a kids. They currently takes care of about 150 kids, providing them education, food and the courage to dream about life. It was Jayan who suggested Sishu Mandir while we were talking about celebrating Diwali in some meaningful way. My friend Kapil also joined us. Jayan's wife, mom and two kids completed the gang. We had spoken to Mr. Anand - the person in charge of Sishu Mandir- the day before, who was quite happy to have us with them. We decided to sponsor the day's lunch for the kids and also took with us some sweets and chocolates. As we were sitting with them, having veg biriyani and sambar for lunch, we realized that even this is luxury for them... a welcome break from the usual white rice and curry. As Kapil rightly said later, 'We all complain about the number of side dishes for lunch, while these kids don't complain even when they get no lunch at all'. After lunch we went and bought some crackers and flowerpots. Some of the elder kids distributed it between all of them. 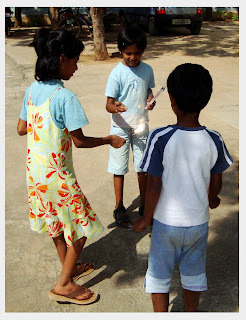 Soon everyone formed their own small groups, bursting the crackers and running around with the flowerpots. There were no complaints as they have long learned to share what they got. Jayan's daughter and son thoroughly enjoyed the commotion and were happily mingling with the kids there. All the kids speaks fluent English and interacts quite well with people. Most of them were girls and it was good to see a lot of them attending school, as they are generally the first to suffer the ill effects of poverty. It was only when I started talking to some of the kids that I realized how badly life has treated at least a few of them. Abhishek studies in the 3rd standard and his mother is the cook at Sihu Mandir. When I asked about his siblings he told me that two of his brothers are dead. He didn't know the 'hows' and 'whys', but remembers that one of them passed away last February. In spite of the harshness of life, he manages to keep a pleasant smile and sang a few songs in an amazingly beautiful voice. Then there was Aishwarya who was carefully preserving the crackers she got. She had an elder sister at home who does not attend school, and Aishwarya wanted to take the crackers home and share it with her sister. 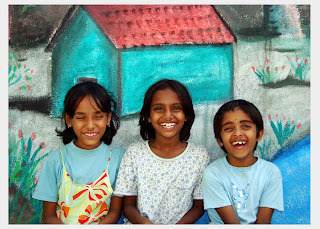 I don't think anyone would have 'taught' these kids how happiness increases when shared, they just know it. As kids we are aware and connected to commonsense and virtues of life, but as we grow up it is all ruined perhaps by the combined effort of situations and society. I know we could not do anything great for these kids, but the short association was definitely sweet. The kids were really happy that we spent some time with them, the sweets and chocolates didn't really matter. A little recognition and affection is worth much more than any financial help we do. The smiles on their faces as we ran around bursting crackers, were much brighter than the Diwali lights. We have decided to go back to the place and associate ourselves with this effort in whatever way possible. We spoke at length with Shalini, a social worker associated with the institution, trying to find work for the single moms in and around the place. She is doing a commendable job getting them trained in house keeping from a nearby hotel. So if anyone is in need of house maids in the KR Puram - Marathahalli area, you can get in touch with Shishu Mandir. 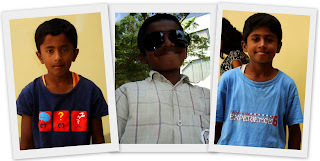 If you feel like spending a day with these kids or helping them in any other way, do get in touch with Anand @ 9342673812. They would be so excited to see you there, that when you walk out of the place you might feel that the kids gave you more, than what you gave them! There are definitely a few things that money can't buy.. for others there might be Master card!